METRO is offering free rides to all area students through Sept. 30, 2017. Many families are left with limited transportation options and disrupted schedules since the storm. Parents accompanying students to school may also ride for free. "The road to recovery is a long one for so many people in our community. We hope the free riders will remove some stress for parents and students as they return to school," said METRO Chair Carrin Patman. METRO staff worked around the clock to get nearly all of the routes running again. A handful are detoured, abbreviated or combined due to high water. 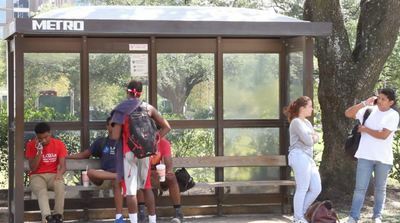 More buses are being used to meet higher ridership demands. "We're going to be very flexible and adapt services to meet the needs of our community," said METRO President & CEO Tom Lambert. Information about METRO's routes and schedules can be found at RIDEMETRO.org. Customer Note: Some printed schedules, METRO's Trip Planner, and Next Bus Texting may not be accurate due to route variations related to the storm.